A storm was approaching so Captain Benjamin Morgado thought he’d anchor the wood chip freighter New Carissa for the night. 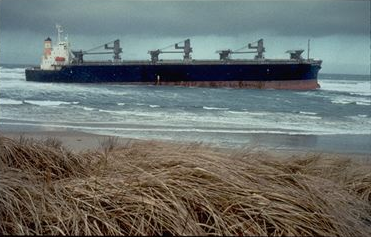 Near Coos Bay on February 4, 1999 the New Carissa, unfortunately, ran aground. 70,000 gallons of oil gushed out of the crippled ship killing thousands of sea birds, and the state of Oregon was left with a big mess to clean up. Then the slapstick cleanup, demolition efforts, and lawsuits began. Ultimately after tens of millions of dollars of fines, settlements, and demolition costs, the last pieces of the New Carissa were removed from the beach in September, 2008.